Joe Cole celebrates his goal against Manchester United at Old Trafford this season. 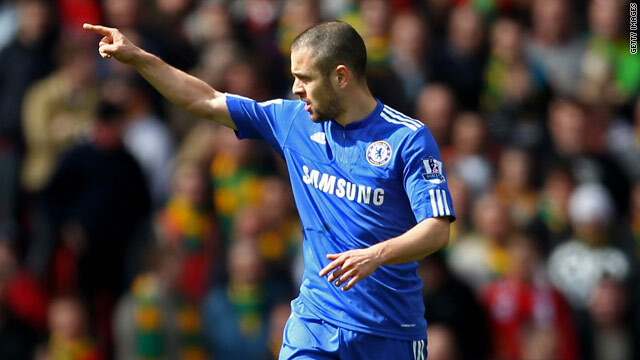 (CNN) -- Midfield stars Michael Ballack and Joe Cole have been released on free transfers by English Premier League champions Chelsea after coming to the end of their contracts. Defender Juliano Belletti will also be leaving Stamford Bridge, the club confirmed on Wednesday. Brazilian Belletti has completed his three-year deal having been signed by former manager Jose Mourinho in August 2007. The 33-year-old Ballack leaves the west London giants after four years, helping them to the domestic double last season. He was injured in the FA Cup final win over Portsmouth, his third with the Blues, ruling him out of captaining Germany at the World Cup finals. His agent, Michael Becker, told Germany's RTL television that Ballack, who is on holiday in Miami, was "completely surprised" by the news. "He has not spoken to Chelsea for three months," he added. Ballack is reported to have wanted a new two-year deal, but Becker claimed that his client would have been willing to accept a one-year contract with an option for a second year based on appearances. Chelsea's official Web site said Ballack would continue to be treated at their Cobham training ground while he recovers from his ankle injury. He has been linked with a return to Germany with his former club Bayern Munich, with reported interest from Jose Mourinho at Real Madrid. Cole, who been at Stamford Bridge for seven years, is with the England squad in South Africa and told reporters Wednesday that he was "just focusing on the World Cup at the moment." The 28-year-old has been involved in protracted negotiations with Chelsea manager Carlo Ancelotti over a new contract without reaching an agreement. "It's been going on a while but it's a story to be told another day," he added. Cole has helped Chelsea to three English titles, three FA Cup triumphs and two League Cups but a serious knee injury in January 2009 halted his progress. But he has returned to form in recent weeks and earned his place in Fabio Capello's 23-man squad. Cole has been linked with a string of clubs and on Tuesday, Harry Redknapp, the manager of Chelsea's London rivals Tottenham Hotspur, publicly expressed his interest.